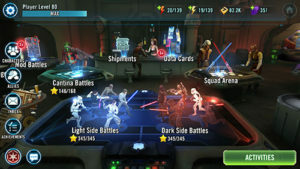 Are you interested in tips on how to play Star Wars Galaxy of Heroes for free? If so you have found what we hope will be an awesome resource for you and many others. Here are a few tips to play Star Wars GOH without spending a dime. Complete ALL daily activities every day, religiously. If you want to be competitive in this game, you need to ensure that you make a habit of completing all of the daily activities. The toughest to remember is the daily Squad Arena battles which are maxed at 5 per day (without the use of crystals) and 3 are required for the daily bonus. Sometimes the Shipments are a pain as I do not recommend wasting Credits on items you do not need, so be patient and login again later in the day if the morning shipments are sub-par. Complete the Galactic War every day. Even if you do not beat all 12 boards every day, max out your team and attempt to beat them all. The green Galactic War Tokens are the easiest way to get characters at 7 stars. Ignore the special data packs. Power up your Jaws and Ewoks, Tusken Radiers, Rebels, Empire characters, etc. For 600-1,200 purple crystals you can buy in to these packs and may even get a “free” character, but avoid these if you want to play for free – unless you are awesome at saving your crystals! If you fall behind, don’t worry and get rolling again. If you are worried about being competitive on this game, but you take a few days off, don’t worry about it. Simply hop back on the train and get rolling again with the items above.